I was critical of New York Times review of this new release for breaking the publisher's July 14 embargo - it would have been party to a clear breach of contract - but nevertheless Michiko Katukani's take on the book is well worth reading. For her this 'sequel' was unexciting and unlovely in its focus on the now bigoted racist, Atticus. A more positive review by Stephen Romei, literary editor of The Australian, does the book far more justice. There have been lots of reviews - the majority rather negative. But I agree with Romei. 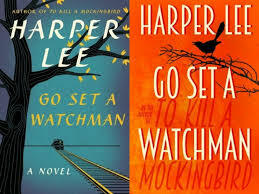 Go Set A Watchman is wonderful, stimulating, and a real pleasure to read.